The other day I posted about my Little DIY helpers and about this series, “Look at my House“. However what I forgot at the time was that I hadn’t actually finished the series, having still to do the bottom floor. The truth is, I was most excited about the ground floor and I think that’s why I saved it till the end. However as the floor that also has the most rooms, I’ve been putting it off as it might take too long. However I’m diving in now, here’s my ground floor! When we first moved in, the lounge was red. The TV was on the wall (right where the sun shone in on it), there were black shelves up (already taken down by this picture), black fireplace and black curtains. It was a proper man den. This needed to be changed before we even moved in as I didn’t like it at all and it didn’t feel homely, so we decorated it a beige colour and tried to lighten the feel of the room. Though this picture was taken on the night we moved in, you can see already the big difference and in all honestly we didn’t touch this room much at all over the years. However in the big redecorate we did touch up some of the areas and of course over the years we have added pictures to the walls and nic naks around the room. I personally think it looks a whole lot better than it used to and on a clean and tidy day, I’m actually pretty proud to call it the heart of my home! The truth is, when we first moved in, the dining room was our junk room. I didn’t really like it as a room anyway and Chris had used it as a gaming room, with his big white board on the wall and everything seemed a bit tatty and dirty. Since it wasn’t essential to our home life, we didn’t really touch it at all, except for tidying it bit by bit as we found room for the items. 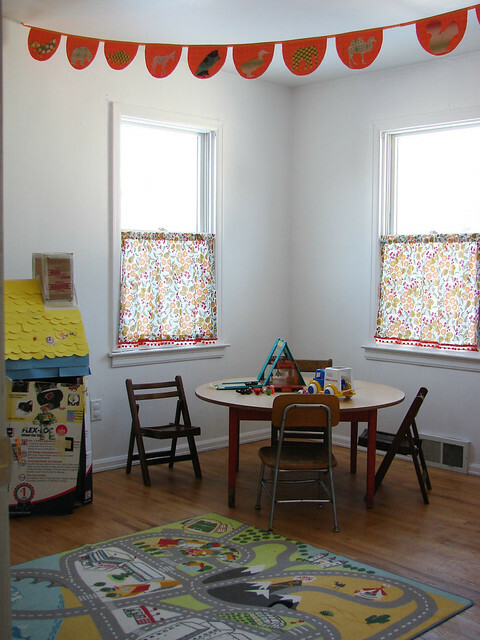 However over time, the dining room also became my work room – especially on the launch of Closet Geek. Even then, everything felt very junky and unorganised. On the day we decided to decorated, I actually had to close my store. I had so much stuff everywhere that it wouldn’t have been possible to work around it and packing it all up and moving it away to a different room was the only option. This was exactly what my dining room/office looked like before packing it all away! Obviously the main outstanding point is that it’s tidy, but believe me when I say we did a lot of work in the room! All the walls were painted, the ceiling was striped and painted, the coving was plastered and painted, plus all the skirting boards and glossing was done. Though sadly it didn’t stay that tidy for long, its now one of my favourite rooms in the house – especially as all my Disney love splurges out there! When I moved in with Chris, the kitchen left a lot to be desired. There was one side of the room which has a tiny sink, one cupboard and a set of drawers. On the other side of the room were 4 wall cupboards and 4 ground cupboards. As such, the first thing we did was add more cupboard space and more work top space. We left the wall cupboards and added extra underneath, including a corner cupboard. On the other side of the room, we added a double cupboard and a larger sink. There was also a free-standing set of drawers, which we put at the side of the cooker, along with a small worktop piece to cover it. Other than that, we didn’t do a lot. We had plans to add a new floor (since it was only half floored), another wall cupboard, paint the walls and re-plaster etc etc. Over the years we added a new light fitting and even bought a new cooker, but the rest just got pushed to one side, until the big DIY we did earlier this year. 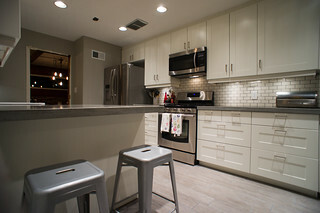 When we overhauled the house, the kitchen had one of the major upgrades. We plastered the walls and painted, we put up a wall cupboard. Of course there was a whole new flooring put down and the top cupboards from before got a new door coating, to pull the white altogether. Believe it or not we didn’t have door cupboard handles or drawer handles for about two years, so we finally got them too! 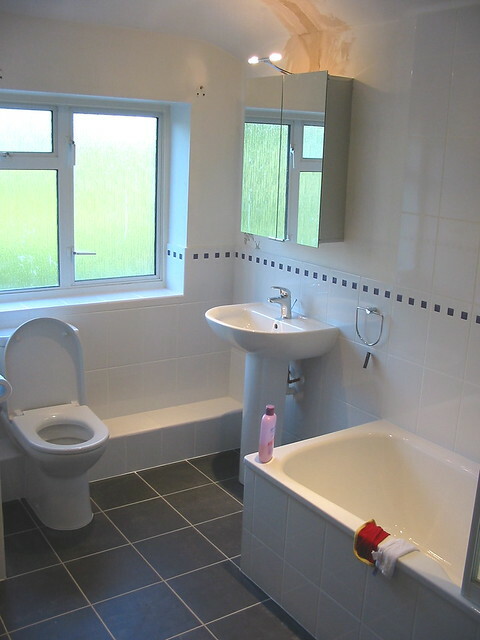 When I first moved in, the bathroom was my least favourite room in the house which was so sad as I love a nice bath to relax and instead I didn’t even want to be in there. The first thing we did was change the toilet seat, add a toilet roll holder, a new lampshade, a place to hang towels and a bathroom cabinet. This definitely helped a little but it wasn’t perfect. I wasn’t keen on any of the wood parts, the radiator was rusty and the wall plaster was peeling. Over the years, we didn’t do much except replace the shower when it broke. However in our DIY overhaul we pretty much sorted it all out. Obviously this is the last of the rooms and the last floor but there was other work done too – both inside and outside. Here are my last few pictures. With house prices rising steadily in the UK – banks are reporting increases from 8.5% overall to up to 20% in some areas of London – you may be considering selling up to take advantage of the housing boom. Maybe you’re thinking that you should put your house on the market right now so you don’t miss out. You have the right idea – you certainly want to strike while the iron is hot. 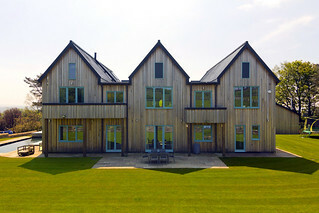 But you really have to ask yourself, Is my house sale ready? If you want to get the most bang for your buck when you sell your house, make some of these tiny changes for huge returns. Have you ever noticed that people tend to gather in the kitchen at parties? It’s considered the heart of the home and one of the first places people want to see when they’re viewing homes for sale. Ensure that you kitchen is clean and up-to-date. Replace the faucet set, update lighting fixtures, and be sure to de-clutter. If you’ve got the budget, ensure that the cabinets match – at least having matching handles. The kitchen should feel homely, bright, and welcoming so that future residents can envision themselves preparing meals there. A not-so-nice looking bathroom can be a huge turn-off to potential buyers and is a common reason buyers will undercut a sale price. A complete remodel of the bathroom can cost up to £8,000 but you don’t have to be that drastic — Bathroom Takeaway has lovely bathroom suites for less than £100! Replace what you can within your budget. If the floor is looking a bit dingy, you can re-tile the floor yourself and save a ton of money. Replacing the tub or shower can really make a huge difference to the look of the bathroom. If that’s beyond your budget, re-grout the tile, replace the toilet seat and sink to completely refresh the room. 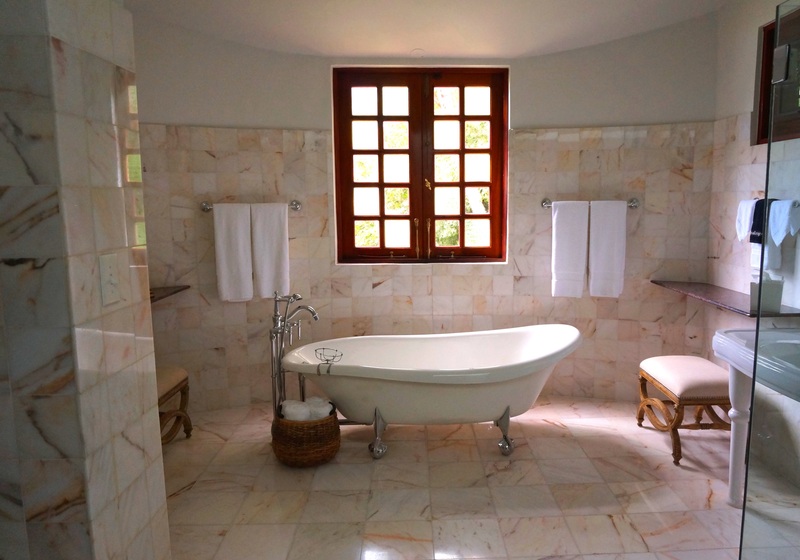 Property valuation experts estimate a new bathroom can add as much as 5% to the sale value of a house, so this should certainly make the top of your priority list. Children’s play rooms were probably great for keeping the kids occupied, but they can actually decrease the resale value of your home. A couple might visit your home and prefer to have a guest bedroom; a single man might want it as a man cave. Let potential buyers see themselves living there. Empty nesters or a single person may view your home and be turned off (even unconsciously!) by a kiddie pool in the backyard or a climbing wall in the basement. Your house should be neutral, so turn that space into a den or another bedroom instead so potential buyers feel like they can make it home. The first impression is a lasting impression, and the first thing potential buyers will see is the outside. People certainly will judge the value of your home based on how its curb appeal, so make sure there is nothing offensive about it. A fresh paint and regular maintenance is all you need. Give your house or front door a fresh coat of paint or change the colour if it’s a hue that divides opinion. A nicely mowed lawn and a clean walkway will make a great first impression. If it fits within your budget, you can hire a landscaper to plant a few shrubs and clean up the yard. Making these small home improvements can change people’s perception of your home and increase its value at the same time. It’s both time and money well-spent if you’re thinking of putting your home on the market.